Why Are Japanese Toilets So Much More Fun? OK, Kohler has a very cool bathtub: the VibrAcoustic tub mashes up your tunes and makes waves while you soak. But c’mon… for fun, how can you beat the Japanese? These toilets sing, dance and even enable you to get interactive; turning the usually mundane task of relieving one’s self into an experience you want to share with the world. Featured below are some of the most imaginative and awe inspiring johns in the world; all based in one country. 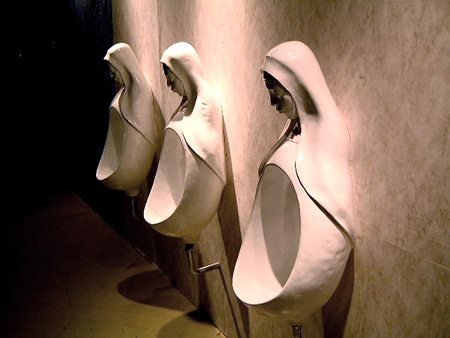 If you’re the kind of person who feels guilty about the notion of peeing in public, then this set of enlightening urinals won’t help to take the pressure off. It does, however, make the experience a little more spiritual though – but we’re not sure if that’s a good thing or a bad thing in this context. 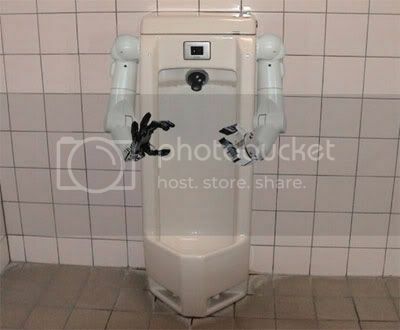 The Japanese nightclub, where this toilet is situated, plays off the country’s penchant for being technologically advanced. (Un)fortunately, the promising looking robotic arms and camera are fake, but the sheer imagination makes up for the defunct mechanics. The question is though; if it was real… would you trust it? The answer: No freaking way. You’ll probably be wetting yourself out of fear after using this toilet. The creepy clown urinal actually has the nerve to bounce up and down, and even sing whilst you do your business – not for those who are prone to stage fright. This toilet (unsurprisingly) has actually become quite a tourist attraction in Japan – just a shame for the ladies, who’ll never actually get to marvel at this feat in technology. For the vast majority who get nostalgic about the retro video games of their youth, this toilet will bring back fine memories. Simply dubbed the ‘Toylet’, you control the character on the screen by aiming for the target located in the urinal – a highly addictive, yet brief, gaming experience. It’s hard to figure out whether this toilet encourages further drinking or building up bladder strength; as you’ll want to save up for every trip in order to beat the top scorer. Ever feel a bit lazy? Too lazy to even put the toilet seat down? Well in Japan this issue isn’t a problem. The toilet featured in this video is actually pretty standard for many of the higher end hotels and, as you can expect, do all the hard work for you. Aside from the peeing bit, you won’t have to lift a finger. And of course, women who want to use a urinal always have the options of choosing Stand2Pee.com. This list of tomorrows toilets was compiled by the tech heads at Ladbrokes Bingo.